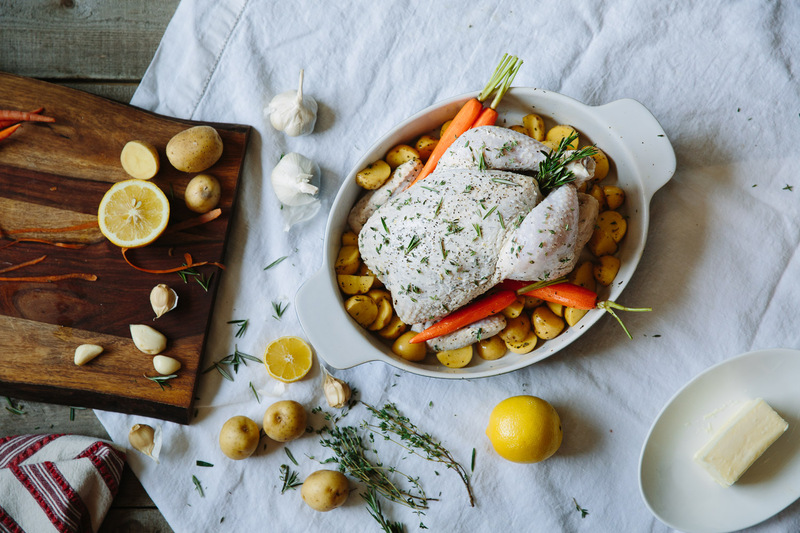 Don't let this whole bird scare you from making a delicious, plentiful meal. The key is in the attention you give the chicken while it is roasting. The more you baste, the juicier it will be! 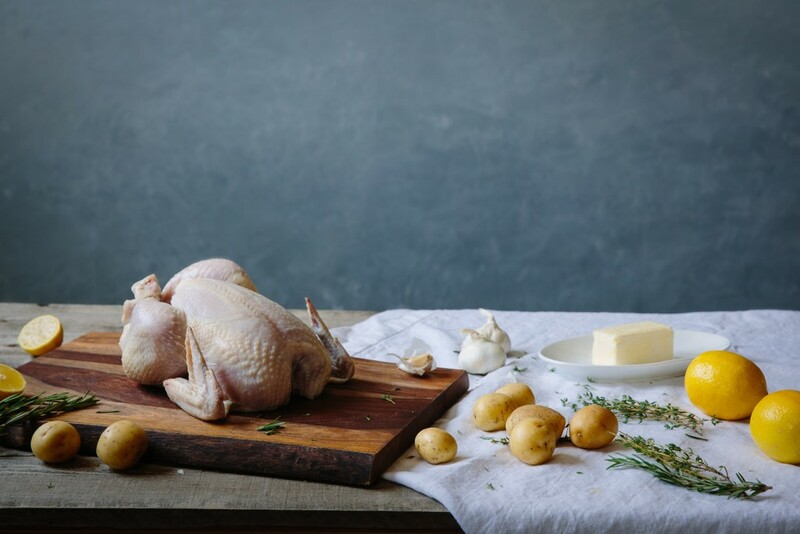 This is a delicious recipe on it's own but is also a wonderful base recipe for anything that calls for shredded or diced cooked chicken. Sprinkle the inside of the chicken with 1/4 teaspoons salt and 1 Tb. butter. Truss the chicken and dry it thoroughly. Rub the skin with 1 Tb. butter. In a small saucepan melt 2 tb. butter, and 1 tb. cooking oil. Set aside for basting. Place the chicken, breast up, in a shallow roasting pan. Strew the vegetables around it and set it on the rack in the middle of a preheated oven. Allow the chicken to brown lightly for 15 minutes, turning it on the left side after 5 minutes, and the right side for the remaining 5 minutes. Baste after each turn with the butter and oil mixture. 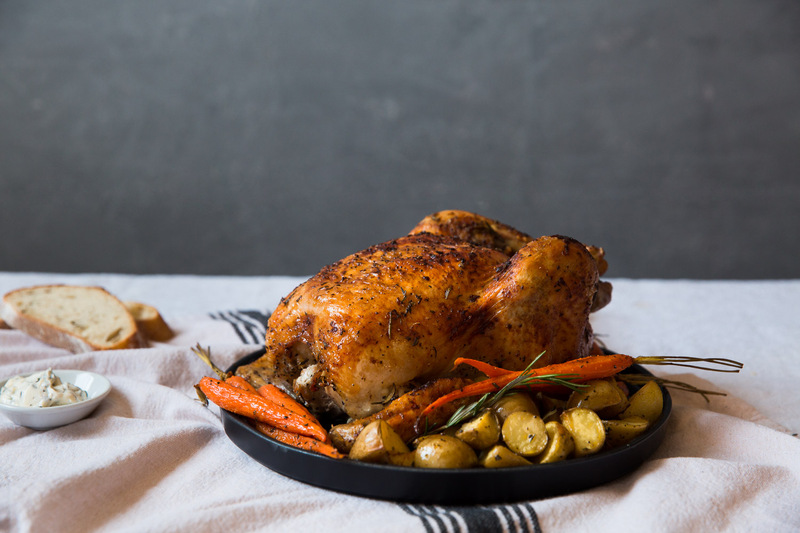 Leave the chicken on its side and baste every 8 to 10 minutes using the fat in the roasting pan when the butter and oil are exhausted. Halfway through estimated roasting time (about 40 minutes in) salt the chicken with 1/4 teaspoons of salt and turn it on its other side. Continue basting. Fifteen minutes before the end of estimated roasting time (about 1 hour and 5 minutes in) salt again and turn the chicken breast up. Continue basting. When done, discard trussing strings and set on a hot platter. Chicken should sit at room temperature for 5 to 10 minutes before being carved so the juices are absorbed by the meat. Chicken is done when it registers between 175 and 190 degrees, depending on your preferred doneness. While the chicken is sitting, remove all but two tablespoons of fat from the pan. Stir in the minced shallot and cook slowly for 1 minute. Add the stock and boil rapidly over high heat, letting it reduce to about 1/2 cup. Season with salt and pepper and swirl in the last 1-2 tablespoons butter. Pour a spoonful over chicken and serve the rest at the table as gravy. Cut potatoes into halves or fourths, making sure they are evenly sized. 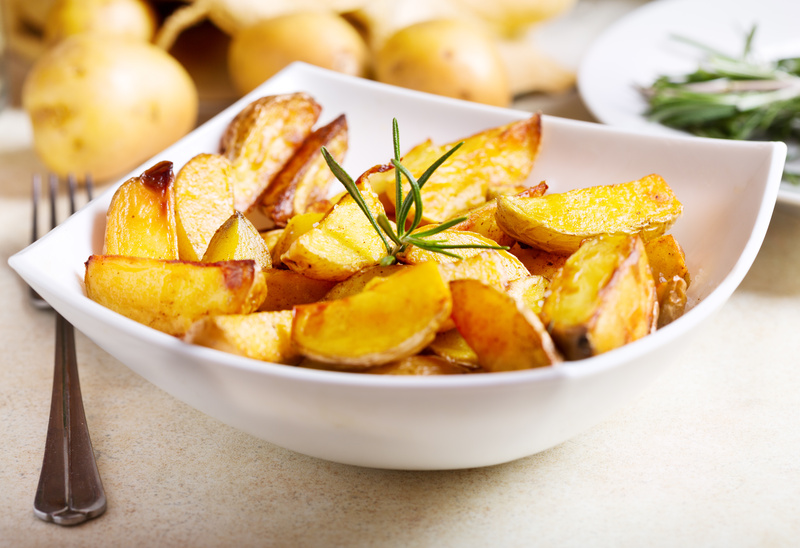 Place all ingredients in large bowl and toss to coat potatoes. Taste for salt and add by judgement. Be very generous. Pour everything out into a shallow, single-layer baking tray and place in 400° oven for 45 minutes or until golden brown. To stay current on all our newest recipes, follow us on Twitter and like us on Facebook! Or if you just can't get enough pictures of food, check us out on Instagram for a daily helping.